Cancer Gene Therapy Market size was USD 805.5 million in 2015, with 20.7% CAGR estimation from 2016 to 2024. 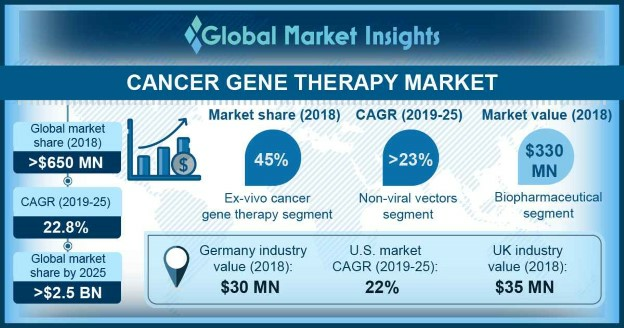 Rapid technological advancements, increased adoption of emerging genomic technologies such as NGS and high-density micro array are some of the factors that will drive global cancer gene therapy market over the forecast period. The rising prevalence of cancer is expected to increase the demand for genetherapy. In accordance with WHO, the number of new cases is projected to rise by 70% in next two decades. The tremendous growth in number of patients should fuel the industry growth. Favorable government regulations will boost cancer genetics industry growth. For instance, Mainstreaming Cancer Genetics (MCG) programme aims to develop clinical infrastructure, assays, informatics, education and assessment that will allow gene testing of patients. The programme offers scalable and convenient tools for the integration of gene testing into mainstream medical practice across the NHS. High development cost of drugs will act as an impediment to industry growth. It’s expensive to conduct clinical trials that includes expensive phase I, II and III for the approval. High cost of clinical trials will serve as a major bottleneck over the forecast time frame. Transfer cancer gene therapy market share was over 46% of global revenue in 2015 and is see growth of 20.9% throughout the forecast period. Adenoviral vector is most commonly used oncology application due to its competent nuclear mechanism and low pathogenicity. Adenoviral vectors are used in gene replacement approaches, suicide gene, gene-based immunotherapy, and syndicate gene with chemotherapy; over 20% growth is forecast for this segment. Retroviral vector-mediated gene transfer dominated the development of gene therapy industry. It provides most significant benefit of converting the single stranded RNA genome into a double stranded DNA molecule, which steadily integrates into the target cell genome. Retroviral vectors are used to permanently modify the host cell nuclear genome. It’s oncolytic actions are mostly through stimulation of the immune system. It will grow at 20.6% CAGR over the forecast period. The gene induced immunotherapy is used for the treatment of cancer disease. It substitutes mutated gene with a healthy copy of gene. A newly developed technique of supplementing novel genes into the tumor that will help to fight against cancer cells is extensively used. Cancer gene induced immunotherapy market accounted for 14% of revenue share in 2015 and anticipated to exceed USD 592.7 million by 2024. China cancer gene therapy market share is estimated to account for 35.4% of APAC revenue in 2015, being the first country to commercialize the gene therapy cancer drugs. Gendicine obtained license from the SFDA for its recombinant Ad-p53 gene therapy for head and neck squamous cell carcinoma. The increasing healthcare expenditure and robust R&D facilities will enable industry growth. U.S. market contributes to 97.8% of regional revenue share in 2015, attributed to rise in the incidence and adoption of advanced treatments. UK is contributing to majority of Europe cancer gene therapy market share in 2015 owing to rise in prevalence coupled with increased adoption of gene technology. Japan was valued over USD 78.2 million in 2015 and expanding at 20.9% CAGR from 2016 to 2024. Major players include SiBiono., Shanghai Sunway Biotech company limited, Altor Bioscience Corporation, Amgen, BioCancell, Aduro Biotech, OncoGeneX, GlobeImmune, Inc., New Link Genetics., MolMed S.p.A, ZioPharm Oncology, Gradalis, GENELUX, MultiVir. Small biotech firms dominate the global cancer gene therapy market. The players are constantly engaged in R&D in order to develop novel methods to treat various life-threatening diseases. Cancer genetics is novel treatment method marked by high costs of R&D. The therapy targets diseases with high unmet needs, this has been driving force behind academic research laboratories, small biotech firms and large pharmaceutical companies. The therapy is short duration treatment or mostly be one-time treatment customised to the individual, and often in small patient populations. The current competitive landscape for cancer gene therapy is dominated by small pioneering biotech firms. The small players may enter into strategic collaborations with larger players to continue clinical development or commercialization of products. Manufacturers will take premium prices for the medicines. Lack of reimbursement policies for advanced gene therapy methods will hamper market growth.